On Monday during the NFL’s weekly Monday Night Football game, Adidas released their latest ad to empower women and girls in sport. It’s core message is that sports brings confidence and with confidence brings tomorrow’s leaders. All women should be given the opportunity to participate and break barriers in sport. WNBA champion Candace Parker who is one of Adidas’ most famous athletes is featured in the ad. To show their commitment, Adidas released an open letter to its employees and to communities around the country. The letter called on everyone to join the effort and together, level the playing field and co-create the future of women’s sport. Follow the brand’s initiative with the hashtag #creatorsunite. She Breaks Barriers film below. Cold As Balls with Candace Parker and Kevin Hart! Hilarious! Comedic superstar Kevin Hart recently began a series called “Cold As Balls” where he talks with professional athletes while sitting in tubs full of ice; a play on how athletes recover after training. He’s had very candid and quite hilarious conversations with the likes of Lavar Ball, Blake Griffin, Draymond Green and now Candace Parker. Candace didn’t back down from Keven’s line of questioning and actually challenged Hart on how much he actually knew about her. Find out why Parker decided to play basketball, who her favorite WNBA player is, why she’s so competitive and much more. Check out the hilarious video below where you get a look into Candace’s personality as she and Kevin have some good-natured banter. Calling all Creators; Adidas Commercial Featuring WNBA Players C. Ogwumike and Parker! Adidas has been in the forefront in their quest to differentiate themselves from other traditional sports brands. They’ve done this by taking an unorthodox approach to who we typically see in ad’s and commercials. Adidas has found a way to reach the “culture” by using musical artists and influencers to spread their message. Most notably, Kanye West, whose Yeezy line has taken the world by storm, and has helped to make Adidas a recurring name in and around pop culture. In their latest spot, Adidas is ‘Calling All Creators’ “Those with the need, to make something new. The game changers, the difference makers, the boundary breakers, the tomorrow takers.” A call for everyone to bring their ideas to the table, to be fearless and to just create! During their round table discussion, featuring some of the most influential stars of sports and pop-culture, you first hear from WNBA player Chiney Ogwumike when she joins in on the conversation stating that “The game will never be the same.” Check out the video below and let us know what you think. 2016 WNBA Champion Candace Parker was in attendance at the Inaugural NBA Awards last night in New York City. Parker presented alongside Vince Carter during the show. Parker has been a fixture at awards shows during her decorated career and does so with grace while looking amazing. She continues to represent the WNBA with class. Look for her again during the 2017 ESPY awards where she is nominated for Best WNBA Player. Check out the video below to see what Candace was most looking forward to about the awards show. On Wednesday Adidas released their global campaign in which the brand features several prominent female athletes discussing how creativity is a major part of their sport. Adidas has been at the forefront in finding unique ways to brand their products and promote their talent. WNBA’s very own Candace Parker, who is an adidas sponsored athlete, talks about how “basketball is all about creativity”. Check out her spot in the new campaign, titled “Unleash Your Creativity”. 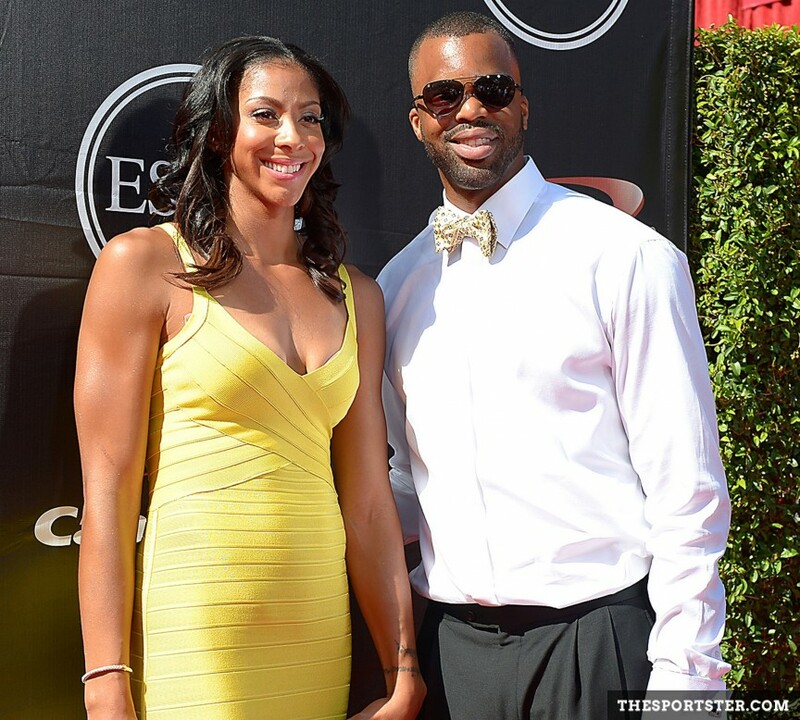 CANDACE PARKER AND SHELDEN WILLIAMS. Just last month WNBA superstar Candace Parker was celebrating her first WNBA championship as the LA Sparks defeated the Minnesota Lynx in Game 5 of the WNBA Finals. Noticeably missing from the celebration was her husband Shelden Williams and now we know why. Married eight year ago, Williams recently filed for divorce from Parker. Together they have a 7-year-old daughter. Court documents filed by Williams, who was the #5 overall draft pick in the 2006 NBA draft, cite irreconcilable differences as the reason for the filing. He stated that they have been living separately since August and he requests joint custody of their daughter. In addition, Williams is seeking spousal support from Parker who is said to bring in a significant amount of money from endorsement deals and overseas play. Williams who played in the NBA for six seasons reportedly made more than 12 millions dollars during his career. Williams hasn’t played in the NBA since 20011 so it is assumed that Parker is currently bringing in more money than him. To note, in California, judges aren’t allowed to consider marital misconduct when making decisions about alimony. The Los Angeles Sparks are your 2016 WNBA World Champions; their third title in franchise history. The Sparks took down the defending champion Minnesota Lynx on their home court 77-76. Lead by Candace Parker who finished the game with 28 points 12 rebounds and 3 steals, winning her first WNBA title. Candace Parker is one of the most decorated women’s basketball players in the world. She led the Tennessee Lady Vols to back to back national championships and was the first overall pick in the 2008 WNBA Draft. Parker has won two WNBA Most Valuable Player Awards, the WNBA Rookie of the Year Award, WNBA All-Star Game MVP (2013), and two Olympic gold medals. She has also been selected to six All-WNBA teams and three All-Star teams. However, Parker has yet to win a WNBA title and tonight, for the first time in her eight year career, she has a shot to finally call herself a WNBA World Champion. The Los Angeles Sparks take on Minnesota Lynx at 8pm ET on ESPN2.